Say you want to let a user do something only once from a single device. For example, to redeem a one-time reward of $100 in-game currency. How can you prevent user from doing said action more than once on their device? Store a boolean flag in UserDefaults which indicate a user has claimed it before. But UserDefaults doesn't persist through App reinstalls, user can simply remove and reinstall the app and redeem it again. Similar to UserDefaults, store a boolean flag in Keychain, it might persist through App removal/reinstalls, but Apple made no promise that this behaviour will remain in future iOS versions. As in iOS 10.3 Beta, removing an app also remove its Keychain data. Use Advertising Identifier to identify a user and send this data to server to check if an user has redeemed it before. However user can also reset this easily in the Settings app. So... what option do we have? Fortunately, Apple has introduced DeviceCheck in iOS 11. It is an API that allows us to access per-device, per-developer data in an iOS device. 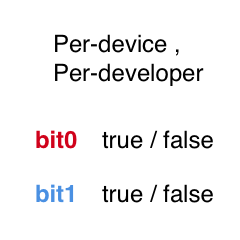 DeviceCheck allows each developer to assign two bits (2x2) of data per-device (note: not per-app, which means if you have 10 apps, they will all share the same two bits per device!). The DeviceCheck class in iOS allows us to generate a temporary token (which Apple server will use to identify a device), then we send this token to a backend server, and then backend server will communicate with Apple's server to retrieve the bit data or update the bit data. This post will separate into app side and server side. Most of the difficult part is on the server side. Note that DeviceCheck will only works on physical device, it will not work on Simulator. You can use .isSupported to check if the current device support DeviceCheck API. You will also need to have a valid Apple Developer account, and sign your project with it. To use DeviceCheck in your iOS project's code, simply import the DeviceCheck module, and use its token generation function. In the code, we initialize a DeviceCheck device by calling DCDevice.current, then we generate a token using .generateToken, and then encode the raw token data using base64 encoding, and send it to backend server. That's all to it for the iOS code! Pretty straightforward right? For this part, I will be using Ruby language for the server side code, you can use any server side language/framework as the same concept still apply. Before proceeding to the server code, we will first need to generate a DeviceCheck Key on Apple developer portal. 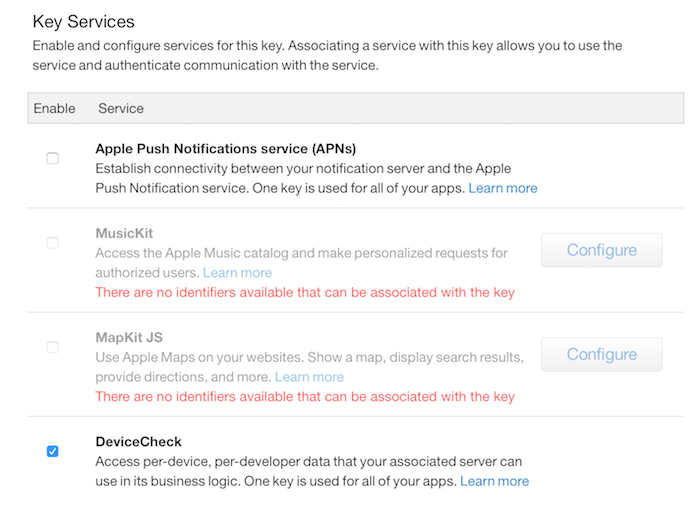 Go to https://developer.apple.com/account/ios/authkey/create to create a key, and check DeviceCheck in the Key Services list. Click continue, download the key file, and also copy the Key ID, we will need this later on. You can open the key file (.p8) using TextEdit App to get its content. This is the most confusing part of communicating with Apple's DeviceCheck API. To verify that the server is owned by you, you will need to use the key file downloaded earlier to generate a JSON web token (JWT). JWT is an encoded string generated with header and payload. Header and Payload is a JSON type. In the header, we will include alg key (algorithm) with value of ES256, Apple mentioned in documentation that ES256 algorithm is used so we will use this. The kid key means key_id, this is the Key ID you copied in previous part. In the payload, we will include iss key (issuer) with value of your Apple developer team's ID, you can get this value here : https://developer.apple.com/account/#/membership . The iat key means issued_at, we will use the Unix Timestamp of current time (in seconds). We need to include this HTTP header when communicating with Apple's DeviceCheck API. To get the two bits state of a device, we will make a HTTP request to https://api.devicecheck.apple.com/v1/query_two_bits (this is the production server for app live in App Store or Testflight). If you are in development mode (plugging iPhone to Mac), use this API instead : https://api.development.devicecheck.apple.com/v1/query_two_bits . We will make a POST request to Apple's server with JSON containing device_token, timestamp and transaction_id. device_token is the 64 base encoded token generated from the app. timestamp is the current time in Unix Timestamp when you send the request to Apple, in milliseconds . 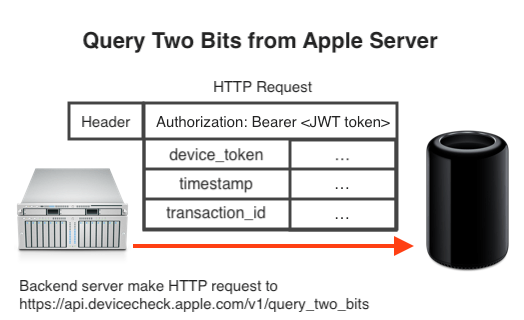 transaction_id is a unique string, this can be any string you want, as long as each HTTP request you make to Apple's server uses a different transaction_id. If the bit state of the device haven't been set before, Apple server will return HTTP response with status 200 and a text of 'Bit State Not Found'. 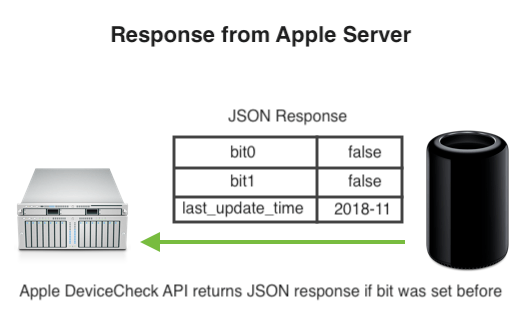 If the bit state of the device has been set before, Apple server will return HTTP response with status 200 containing JSON. To update the two bits state of a device, we will make a HTTP request to https://api.devicecheck.apple.com/v1/update_two_bits (this is the production server for app live in App Store or Testflight). If you are in development mode (plugging iPhone to Mac), use this API instead : https://api.development.devicecheck.apple.com/v1/update_two_bits . 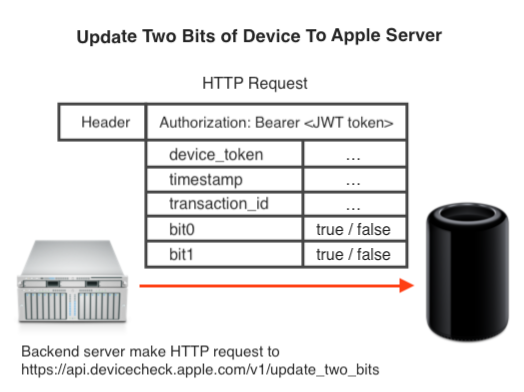 We will make a POST request to Apple's server with JSON containing device_token, timestamp, transaction_id, bit0 and bit1. bit0 is a boolean, you can set this to either true or false. bit1 is a boolean, you can set this to either true or false. Apple's server will return a blank HTTP response with status 200 if the update is successful. In your server code, you can make an API endpoint say '/redeem' , the iOS app will make a HTTP request (containing device token) to this endpoint (https://example.com/redeem) , then the server will use the device token and check with Apple's server. If bit0 is not set or is false, user can redeem the reward, else user can't. Server can set back a JSON telling the app that user can/can't claim the reward. After user claim the reward, server will make another request to Apple's server to update bits (set bit0 to true). DeviceCheck is very useful and is the only legit way to uniquely identify an iOS device (as of iOS 12.1). However there is only two bits to use and this is shared among all the apps ,not two bits per app. If you have 10 apps, all of them will get the same bit data.